Part of the Backbeat series about the electric guitars used in the Rock world, this book is about the Gibson "futuristic" guitars, namely the Flying V, Explorer and Firebird. The book's tongue-in-cheek subtitle which explains all is "an odd-shaped history of Gibson's weird guitars"! As the book explains, the reason behind the design of these guitars was that Gibson (around 1957) was accused by Leo Fender of being dull. As an antidote to this viewpoint and a challenge to the "space themed" Fender Telecaster, Gibson designed some "out there" guitars. They caught on to some extent, but not to the same degree as the Les Paul – but certain models are now collecting serious prices. There are photos of famous players of this range of guitars; because of its symmetry the Flying V was of interest to left-handed players and to prove that point, the book contains a still of Albert King playing one left handed (with the volume pots on top rather than below). The other Flying V guitarist I looked out for was Michael Schenker and sure enough he is featured (now of course he has a Flying V range under the Dean guitar umbrella). 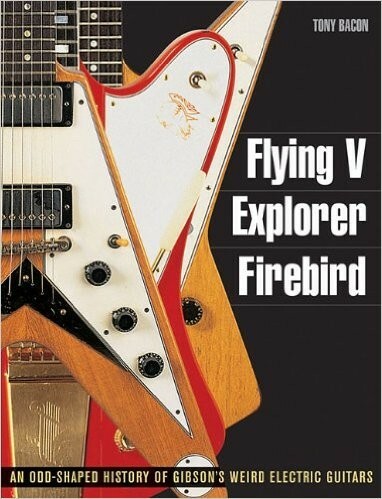 This impact of the Gibson futuristic guitars is also touched upon by the book and sure enough the aforementioned Dean and Jackson guitars in all their pointy glory are illustrated (a great photo of Dave Mustaine and his Jackson Flying V is contained in the cover pages). As in all books in this series, the final chapters contain detailed reference about the makes and models (down to serial numbers) of these guitars. If you own one of these guitars (or you are just interested), this book is well worth a purchase to understand the importance of these "futuristic" guitars in the history of Rock.